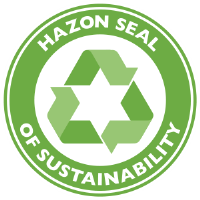 The J is excited to announce that for the second year in a row, we’ve been awarded the Hazon Seal of Sustainability (2017 & 2018). We’re so proud of our JOFEE (Jewish Outdoor, Food, Farming & Environmental Education) Director Michael Fraade for the hard work he put in to making our facility a greener, healthier place for our community! The J’s Jewish Outdoor, Food, and Environmental Education (JOFEE) Department works to build a healthy, vibrant, sustainable, and just community by engaging participants of all ages’ sense of curiosity, consciousness and gratitude. JOFEE programs include The J’s educational garden, which provides produce for the Jewish Family and Career Services (JFCS) food pantry as well as The J’s senior adults and preschoolers; the Gendler Grapevine Fresh Stop Market, a sliding-scale local produce market that makes fresh vegetables accessible for everybody regardless of income or other resources; sustainability initiatives such as composting, recycling and carbon footprint reduction; and educational opportunities such as dinners, food demos, youth education, interfaith events and service projects. We hope that you will work with us to maintain the environment’s health by participating in JOFEE programs at The J as well as environmental efforts in your own homes. We are confident that we can make a difference and that coming together to appreciate the world around us will benefit the physical and emotional health of generations to come. For more information about JOFEE, please click on any of the links below or contact Michael Fraade at mfraade@jewishlouisville.org or 502-238-2769.